[Interview] X-Men: Gold artist Ken Lashley explains the evolution of his style at Boston Comic Con – AiPT! We caught up with “X-Men: Gold” artist Ken Lashley at Boston Comic Con to talk about the evolution of his style. Marvel’s X-Men franchise has always attracted artists that were gifted with extraordinary artistic abilities. But fans know better than to get too attached, as these illustrators eventually leave for new adventures. Artist Ken Lashley is one of the rare exceptions. Much like Kitty Pryde in X-Men: Gold, the popular series he currently pencils, Lashley came back. The artist cut his teeth on X-books like Excalibur in the 1990s, went away for a time, and has returned to draw series like the recently concluded Uncanny X-Men. AiPT! had a chance to learn more about the unique trajectory of Lashley’s career at Boston Comic Con 2017, where he was signing and illustrating. AiPT! : I first started reading X-books right before the Age of Apocalypse began. So I remember your work on titles like X-Calibre. A lot of the artists who were on books in the ’90s are no longer getting work, while you’re on major series like X-Men: Gold. To what do you credit your continued success? Ken Lashley: I don’t know. I think I evolved a little bit – maybe that’s what it is. I was really young, so maybe I hadn’t evolved as an artist yet. Now I’m coming into my own a little bit. Back then, it was raw stuff. Now, I’m more refined. And sometimes if you’re just around enough, you get opportunities. So I’ve been pretty fortunate. Also, I haven’t done comics 100%. For a lot of years, I was working at Hasbro or dabbling in design work or working at Lucasfilm. So I don’t have a phenomenal breadth of comic book work. I’ve dabbled in it for 30 years, so I probably have maybe 300 or 200 issues, which is not a lot when you think of a 30-year career. Maybe that’s why I’m relatively fresh. AiPT! : And your style has evolved since then. Lashley: Yeah, I couldn’t draw! AiPT! : I thought you were pretty good! Lashley: I don’t know about that. Let’s be honest, I was a young kid. My stuff wasn’t very good. And it was the early ’90s – everyone got hired. So that’s what happened. I really shouldn’t have been drawing an X-book at that age. I probably should have been working on my craft, but now I’m at that point where I can do better work. AiPT! : I have noticed the change in your style since the ’90s – that was a conscious decision? Lashley: As an artist, you have to evolve. Even if you’re drawing every day, you can’t help but evolve. For me… I was young, I didn’t understand. I never had a real job where I was making real money. I’d worked part-time jobs, but this was my first real job and I made a lot of mistakes. Now I’m older, I’m more wise – sort of – but I know what I’m doing now. AiPT! : What attracts you to the X-Men side of the Marvel Universe? Lashley: I’m an X-Men fan. I was a John Byrne guy growing up. The first book that really hooked me was by John Byrne. 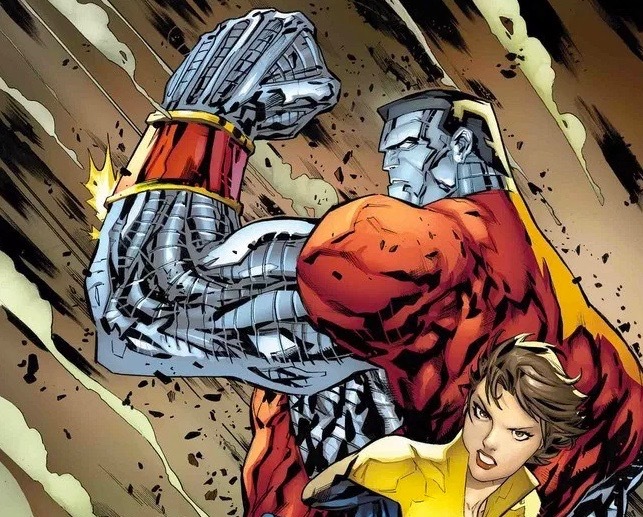 So getting to draw X-Men: Gold with Colossus, Kitty Pryde and Nightcrawler in it is like a dream come true. Also, not a lot of artists get a chance to go back and draw characters they drew before, so its kind of interesting drawing Nightcrawler now. The universe has sort of aligned so I can fix my mistakes. AiPT! : What’s the best part about working on X-Men: Gold? Lashley: Colossus is my favorite character. AiPT! : Is he your favorite to draw too? AiPT! : What’s the last cool image you drew? Lashley: Oh, X-Men: Gold #16 is pretty rad – that was a lot of fun. AiPT! : What’s fun about it? Lashley: I can’t tell you! It’s terrible – I answered your question without fully answering your question. AiPT! : Finally, you’re very active on social media. Obviously, Instagram wasn’t around back in the ’90s. How important is it for today’s artists to use social media? Lashley: I think it’s crucial. I don’t think you can be successful if you don’t have a good online presence. You have to be accessible to the fans, you gotta show them what you’re doing – maybe pick and choose what you can and can’t show – but you have to to be successful. I spend a good portion of my day responding to comments and posting. I also love the fans. I’m just a fan! The type of work you can find on Lashley’s Instagram page.